At a time when women had few rights, the Lady Eleanor sits totally bored, working endlessly on her embroidery, dreaming of forbidden adventures. Media: Head, hands and feet of Super Sculpey on a wire armature, with a cloth body. 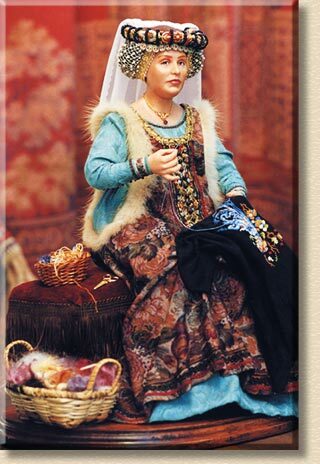 She has brown mohair braids under her net caul.headdress. She wears a turquoise brocade under-dress, and a wine, beige and green velour over-dress with fur-edged sleeves, and trimmed with gold, wine and green trim. Props: She sits on a handmade bench upholstered in red velvet. She's working on a cross-stitch tapestry hand-embroidered by Marianne. Beside her there's a basket with embroidery threads, a scissors, and there's a basket with dyed unspun wool on the floor.